The British Coatings Federation (BCF), along with the Green Blue (a joint initiative between the Royal Yachting Association and British Marine) and the Yacht Harbour Association (TYHA), will launch their Protect, Collect and Dispose Antifouling Initiative at the 2019 Marina Conference in Bournemouth on 24th-25th April. The objective of the initiative is to inform as many people as possible about environmental best practice when antifouling boats. This initiative builds on the successful, award-winning DIY Safe Antifouling programme BCF, RYA and British Marine launched in 2017. 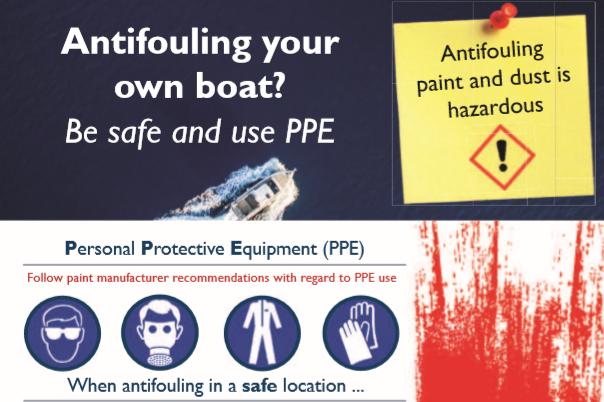 It is intended for those who antifoul their own vessels, as well as for marinas and boatyards who are offering professional antifouling services. An informative trifold leaflet has been produced explaining how to best protect yourself and the environment, especially with regard to collecting paint debris and disposing of waste. A weather resistant poster is also available for display in chandlers, marinas and boatyards. Click to download the 16 page guidance pdf on how to prepare the boat hull, apply antifouling paints safely and best practice for cleaning up and waste disposal.